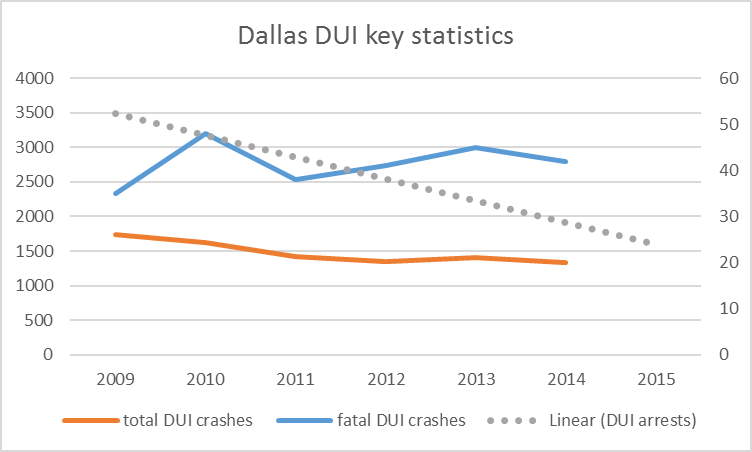 Dallas’s slashed DUI enforcement = safer roads? Fatal DUI crashes uses the right axis. The DUI arrests dotted line is a linear approximation using actual numbers from 2009 and 2015. Fatal DUI crashes didn’t meaningfully change. All DUI-related crashes have dropped by 23%. In a sloppy hit piece on Dallas police chief David Brown, WFAA journalist Tanya Eiserer misses this. Instead, she stokes moral panic to drive more enforcement. Is ineffective enforcement an anomaly? Probably not. My doctoral dissertation was over a closely-related topic. In short, I found that differences in traffic ticketing levels have no effect on crash counts. This echoes research from other areas with similar findings. Last year, 15 men and women died in Dallas in drunken driving accidents. Tell it to them and their families that drunk driving enforcement isn’t a priority. In cutting DUI enforcement, Chief Brown reduced spending on something that isn’t working. But that doesn’t play into MADD’s neo-prohibitionist agenda, so it has to change, I guess? Posted on February 5, 2016 Categories Traffic SafetyLeave a comment on Dallas’s slashed DUI enforcement = safer roads?